The 1990 Formula One season was packed with legendary drivers: Senna, Prost, Piquet, and Nigel Mansell, who drove this very Ferrari. The 641 was a development of the 640, which was used the season prior. So this is a race winning Formula One car that had three podiums in five races and was raced by one of the sports legendary champions. It was used in the second-half of the season, presumably hence the “/2” (indicating updates on the car). This is one of seven or eight 641 chassis built and a handful are in private hands. It would be a most fun track day car, if you have the means. It should sell for between $800,000-$1,100,000. Click here for more info and here for the rest of Gooding’s lineup. 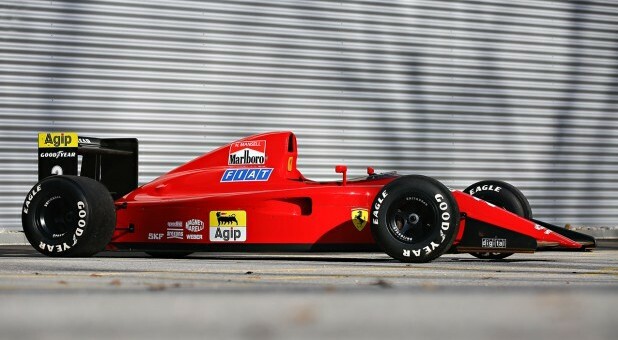 This entry was posted in Uncategorized and tagged 1990, 641/2, auctions, cars, f1, ferrari, formula 1, formula one, gooding & co, race cars by classiccarweekly. Bookmark the permalink.